In 2015 LUH was chosen as a pilot site for a new national eRostering system which is used to create and manage staff rosters, align rosters with service demands, record staff attendance and report compliance with employment law. 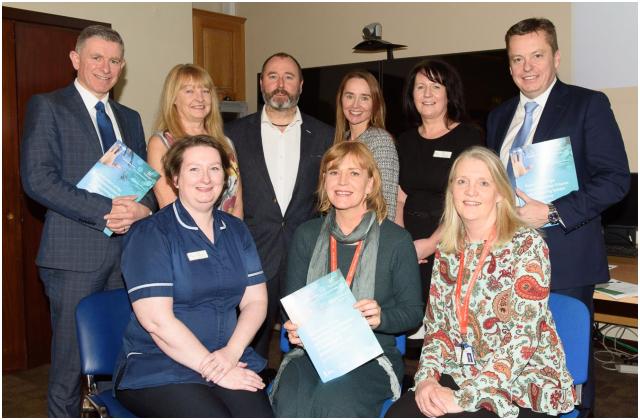 Following the successful implementation at the hospital, the Ulster University was appointed by the HSE’s Nursing Midwifery Planning and Development Unit to evaluate the project and their findings will be used to guide the roll-out of eRostering to other hospitals throughout the country. The Clinical Nurse Specialists (CNS) in Letterkenny University Hospital have introduced a new system to track all episodes of care electronically which means that the full picture of all interactions with the CNS staff is available instantly when patients meet with their consultants or are referred to the Emergency Department by their GP. The information is real-time and can be accessed by multiple clinical staff at the same time which improves sharing of relevant information rather than waiting on paper records to be manually updated. Dr Anne Drake, Director of Nursing, Quality and Patient Safety, LUH said, “I am extremely proud of the initiative taken by nursing and midwifery staff to lead out on the use of technology to improve the way we organise ourselves to deliver care to our patients. I would also like to pay tribute to all our colleagues across various disciplines and departments who have supported our nursing and midwifery staff to embed the technology into everyday practice. “The evaluation of the implementation of the eRostering system at the hospital by Ulster University recognised the success of the project and attributed it to ‘access to technical support, positive staff attitudes and beliefs, leadership support, staff champions and evidence of the advantages of the new system’. “The Donegal Telephone eTriage system has been in place since October 2018 and currently the Clinical Nurse Specialists in renal, oncology and haematology services are using it with other clinical and midwife specialist services due to come on board. We will also be looking at the potential for using the system to support integrated care between the hospital and community services. In the past 3 months, the system has been used to log 580 instances of care for 340 patients. We are looking forward to developing this technology further to support safe and professional nursing and midwifery practice here at Letterkenny University Hospital”. The evaluation report of the Letterkenny University Hospital eRostering pilot was presented to the hospital last month. Standing from left: Dr Patrick Glackin, Director, HSE Nursing Midwifery Planning and Development Unit (NMPDU); Dr Anne Drake, Director of Nursing, Quality and Patient Safety, LUH; Dr Paul Slater and Dr Felicity Hasson, Ulster University; Michelle Donnelly, Assistant Director of Nursing, LUH; and Gareth Rowley, Business Development Manager, Allocate Software. Seated from left: Ger O'Connor, Clinical Nurse Manager3, LUH; Yvonne Hanson, eRostering Systems Administrator, LUH; and Deirdre Keown, NMPDU.